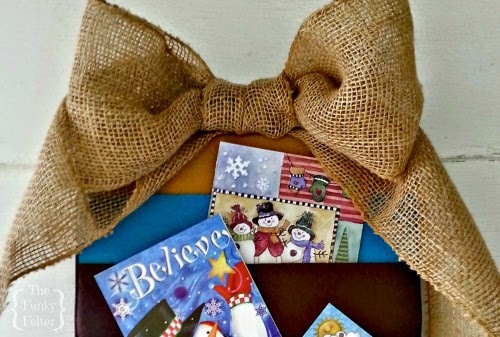 Make this craft in less than an hour to hold all your Christmas cards this year! I have a stack of felt craft sheets in many colors. They've been collected as leftovers from previous craft projects here and there. 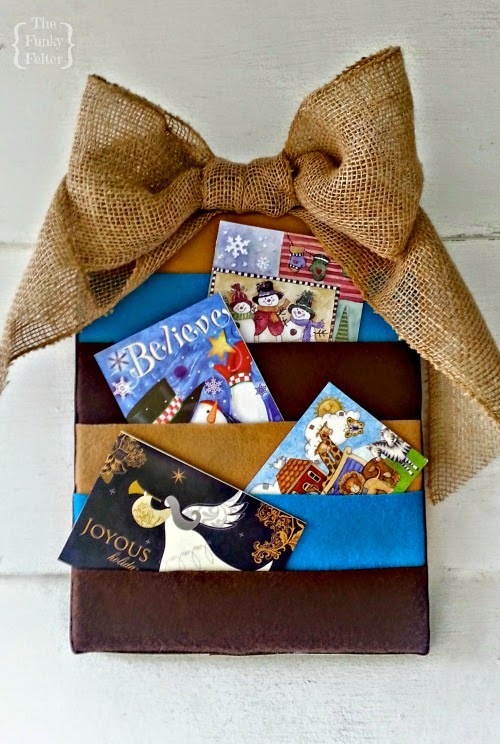 This tutorial used just three sheets of my leftovers to make a pretty Christmas card holder. I also made use of an old art canvas that was leftover from previous projects. All-in-all this is really a recycled or upcycled craft I suppose - just not using cans other stuff pulled from my recycle bin like usual. Anyway, it is a simple and inexpensive craft that you can make with upcycled felt, fleece or fabric and an art canvas or even cut board or foam core. Feel free to improvise on this one! 1. First fold each felt sheet in half lengthwise. Then cut each in half down the center. Temporarily stack the sheets in the color order you would like to show on your card holder. For instance, mine stacked up dark brown, blue and light brown just to make it easier later when securing them down. 2. Beginning at what will be the top of your finished card holder canvas, lay out the varying colored felt sheets as seen in the photo below. When securing them down, you will stack them from the top to the bottom, overlapping each one about halfway onto the next one while covering the canvas edges as much as possible. If needed, pull on each piece of felt lengthwise stretching it a bit before laying it down on the previous sheet in order. Try your best to overlap those side edges. 3. Use the stapler or hot glue gun to secure the felt pieces to the canvas along all the edges. Place one down after the other as seen in the photo. Stretch the felt tight as you go. Cover as much of the canvas edges as you can while making it tightly fitted to the canvas surface. For added security, I hot glued along the bottom edge only of each sheet before overlapping and securing the next sheet in place - creating a little pocket. This way, your cards are certain not to slip down behind the felt layers. Leave the top edges open though to put your cards into. I also folded over the corners as seen in the photo above and hot glued them in place for a cleaner look. 4. To cover up your staples or hot glue smudges, adhere a thin ribbon around the edge of the canvas. Then top it all with a large bow of burlap or other material. You could also use a big wrapping bow, another holiday embellishment or nothing at all - whatever you prefer. Now you're all done! Just hang it on the wall and fill it with pretty Christmas cards as they come in the mail. If you happen to get a lot of cards each year, you can always use a larger size canvas cutting your felt fabric or other material in strips to fit it. I used this size canvas because I had it on hand and it fit well with the standard craft felt sheet sizes. Another option would be to make a few of these at once and put them on different walls throughout your home. Like my holiday craft project? I have brand new craft tutorials coming up soon. Be sure to follow me or subscribe to my feed on the sidebar to get those posts. Don't miss out!